Irish Figure Painter, Romantic Nationalist Artist: Biography, Paintings. A noted portrait and figure painter, influenced by both Romanticism and Realism, Sean Keating was an Irish nationalist painter who executed several iconic images of the Irish Civil war era, and of the ensuing period of industrialization. One of the great exemplars of representational painting in Ireland, Keating was an intellectual artist in that he set out to depict the birth and development of the Republic of Ireland, and his pictures are deliberately idealized even heroic. However, he held very conservative views about art - verging on the academic style - and was a committed defender of traditional Irish painting, considering much modern art to be bogus. Born in Limerick, Sean Keating studied drawing at the Limerick Technical School before winning a scholarship, arranged for him by William Orpen, to study fine art painting at the Metropolitan School of Art in Dublin. In 1914 he won the Taylor Scholarship and the following year exhibited three paintings at the Royal Hibernian Academy. Over the next period of years he spent time on the Aran Islands off County Galway, and then in London. He returned to Ireland in 1916 and painted the war of independence and the subsequent civil war. Works he completed at this time include the painting: Men of the South (1921) depicting a group of IRA men about to stage a military ambush, and An Allegory (c. 1922) which features a cluster of figures representing the fractures in the young Irish state. Meantime, in 1919, Keating was appointed an assistant teacher at the Dublin Metropolitan School of Art. Then in 1921, he staged his first one-man show at The Hall, Leinster Street. In 1923, he was elected to the Royal Hibernian Academy. In a Dublin exhibition of Irish art held in 1924, Keating was awarded the gold medal for his picture Homage to Hugh Lane - now hanging in the Hugh Lane Gallery. In the late 1920s, Keating was commissioned to record the building of the hydro-electric power generator at Ardnacrusha, near Limerick. He painted a number of paintings of this scheme. Not unlike the Soviet Realism School of painting, these paintings sought to promote the construction work as an achievement of heroic proportions. Keating's works began to attract interest abroad. He exhibited at the Royal Academy in London and, in 1930, he held a one-man show at the Hackett Gallery, New York. In 1931 Keating's one-person exhibition was staged at the Victor Waddington Galleries, Dublin. In 1934 he was made professor of the National College of Art in Dublin, and Professor of Painting, three years later. His 1937 exhibition at the Victor Waddington Galleries attracted considerable interest. In 1939, he was asked to paint a wall-painting for the Irish pavilion at the New York World Fair and duly created a huge mural of fifty-four panels. He was President of the Royal Hibernian Academy from 1949 to 1962, exhibiting nearly 300 works during the period. In 1963, a retrospective exhibition was staged at the Municipal Gallery of Modern Art, which was opened by Irish President de Valera. In the 1966 Golden Jubilee of the Easter Rising Exhibition at the National Gallery of Ireland in Dublin, Keating showed six portraits: those of John Devoy, Erskine Childers, Terence MacSwiney, Thomas MacCurtain, General Michael Brennan and Dr Ella Webb. (During his lifetime he painted about one hundred portraits.) Sean Keating passed away at the Adelaide Hospital, on 21 December 1977. Through his paintings, his teaching and his role in the organizations of the day, he was one of the formative influences on the history of Irish art in the 20th century. 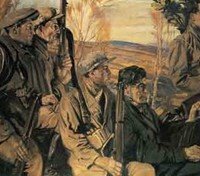 Keating's oil painting Men of the South (1921), now in the Crawford Gallery Cork, depicts a 'flying column' of IRA soldiers, ready for action during Ireland's War of Independence. Keating painted it from sketches and photos he had made of rebels prepared to 'sit' for him. Like all classical history painting of this genre, it evokes the courage and ideals of the subjects rather than the bloody contradictions of a violent war. In this sense, despite its representational style, it remains an essentially Romantic composition. Keating's landscape painting Men of Aran (1925), inspired by visits to the West of Ireland, is one of Sean Keating's best works. The dynamic asymetry with the figures in the foreground all staring fixedly at a point out of our sight recalls his other great painting The Men of the South, which displayed similar types and stances. The foreground figures are impervious to the activity below them, and this gives the painting it's great energy. Unlike his fellow Irish artist Paul Henry, who focused on the landscape itself, Keating regards the landscape as subordinate to the figure and the action taking place. 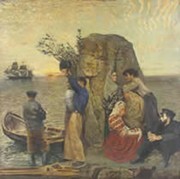 The auction record for a work by Sean Keating was set in 2005, when his nationalist oil painting, entitled Men of Aran - An Tra Inis Oirr, was sold at James Adams, in Dublin, for €190,000.  For details of other traditionalist painters and sculptors, see: Irish Artists: Paintings and Biographies.  For more about nationalist painters in Ireland like Sean Keating, see: Irish Art Guide.  For more about representational art, see: Homepage.